Venture to Amazonia and get up close to the animals that thrive along the Amazon River—the largest river basin in the world. Explore the flooded forest, rich with turtles, sting rays and arapaima, one of the largest freshwater fishes in the world. Trek through the rainforest where titi monkeys, roseate spoonbills and yellow-rumped caciques roam free. Catch a training session: keepers use a target to encourage the arowana to leap out of the water to catch prey, just as wild arowana do. In the Amazonia Science Gallery, get a look at cutting-edge Zoo science and learn how we are working to protect species around the globe. In the Science Gallery, you can also see two in-depth exhibits—Amphibian Alert and the Coral Lab. At the Amphibian Alert exhibit, peer into the world of frogs, salamanders, caecilians and other threatened amphibians. Learn how Smithsonian Conservation Biology Institute (SCBI) scientists are working to save the wild populations of these species from the deadly chytrid fungus. 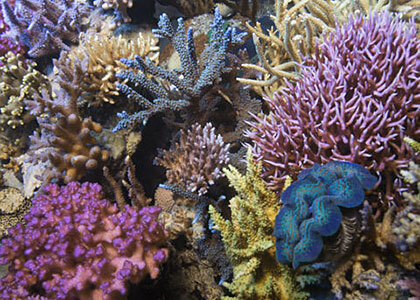 At the Coral Lab exhibit, learn how corals support life in the ocean and on land. Watch the tentacles of the elegance coral sway in the current, spot clownfish hiding among the anemones and see the colorful peacock mantis shrimp scurry around its exhibit.